St Matthew's is home to arguably the finest parish church organ in the country. The fine four manual organ was built in 1895 by the firm J W Walker and Sons and is now of great historical importance. 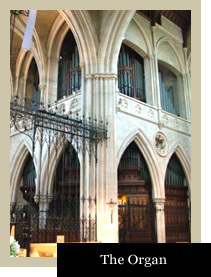 In 2005/6 the organ underwent a major restoration project costing in excess of a quarter of a million pounds. 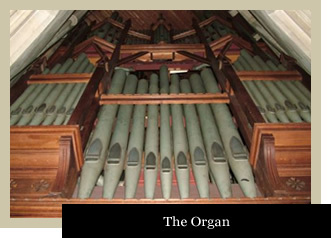 St Matthew's organ is one of only a few Walker instruments of the period to remain in their original form and may be favourably compared with such instruments are those in Bristol Cathedral and St Mary's, Portsea, Portsmouth. No significant changes were made to the instrument between its completion in 1895 and 1971. At that date the actions and console were replaced. No other changes were made, which is a cause for great satisfaction as the structure and pipework survive in their entirety. In 1978 the church installed a forced-air heating system and the organ was fitted with a humidifier shortly afterwards. In 1980 a new blowing plant was installed, replacing the previous equipment dating from the 1920s and in 1982 tuning slides were fitted to the pipework to protect it from damage. In 1990 the Solo Organ actions, reservoirs and tremulant were fully overhauled and re-leathered. During the 1990s and early part of this century the organ became increasingly unreliable and difficult to maintain. The decline of the instrument has been accelerated by the damaging effects of the forced-air heating system. The new system, installed at the same time as the organ was rebuilt, is designed to greatly minimize these effects benefiting the organ and fabric of the church generally. The extremely comprehensive proposals have been carried out to the highest standards with utmost regard for the original builder's intentions. No other tonal alterations have been made, except the extending of the Trombone rank, and all original components retained and repaired. The organ is acknowledged as an outstanding example of the organ builder's art and has responded well to sympathetic restoration. The instrument has been restored to first-rate performance and equipped with contemporary playing aids, greatly increasing its versatility. "There can be no question about the organ's superlative quality and historic value. Its impressive tonal structure and physical layout remain unchanged, and command respect. It has a monumental integrity, and is ideally suited to the church." Further history of the Organ can be found in the excellent new St Matthew’s PCC publication, The 1895 Walker Organ of St Matthew’s Church, Northampton. Priced at only £5 the book gives a detailed account of the Organ’s life from 1895 to the present day. Copies may be obtained by contacting the Parish Office.